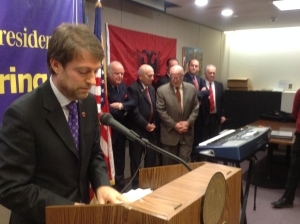 Manhattan Borough President Scott M. Stringer, Bronx Borough President Ruben Diaz, Jr. and Assemblymember Mark Gjonaj and former Assemblymember Stephen Kaufman joined together with the Albanian-American Society Foundation and the Sons and Daughters of Albania in America on November 25th to honor distinguished individuals in memoriam for their contributions to the cause of Albanian and Kosovar Independence. Ambassador Hoxha was present and made remarks at the event. Explenation of position by the Delegation of Albania to the Third Committeee of the General Assembly on the adoption of a Resolution on the Situation of Human Rights in Myanmar, 18 November 2013. Presentation of H.E. Ferit Hoxha, Permanent Representative of Albania to the United Nations at the event organized by the Institute for Human Rights of the KEAN University, New Jersey, on 14 of NOvember 2013.